13. Owner should check all nuts/bolts/screws on the pool/deck/fence to ensure everything is tight especially before and after a large group of swimmers. 1. Insist on life vests for non-swimmers: Anyone who cannot swim or stand safely in your pool should wear one or use a certified inflatable device. 2. 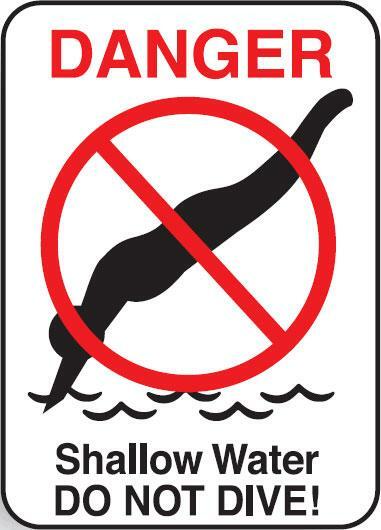 No diving off the edge: Most pools have no depth markings, identifying when you are in the deep end. That transition slope is hard to see and can cause a broken neck if one hits his/her head on it. 3. 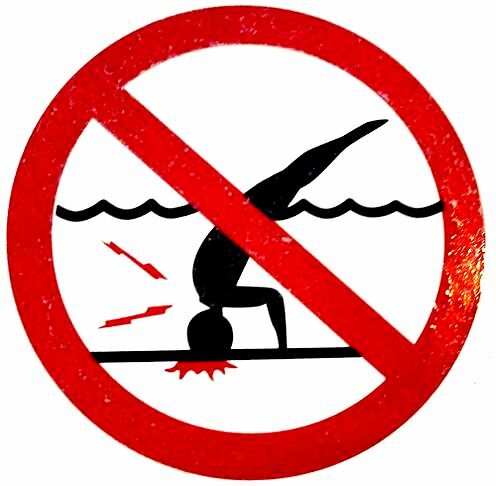 No diving in any aboveground swimming pool: Be sure there are adequate warnings to advise your family and guests that this is a NO DIVING POOL and they risk serious neck injury if they dive. 4. Never go down any waterslide headfirst: Water levels at the tip of the flume often fall due to dehydration and lack of attentiveness on those charged with insuring that the water back flows into the slide, to slow your body down. If the water drops too low, you risk severe injury because the pools are shallow to accommodate all ages, sizes and shapes. 5. Install proper safety fencing: Contact your township to be sure the fencing around your pool complies with codes and ordinances. 6. Install alarms and motion detectors: Check with your town for existing ordinances governing these devices that keep unwary parents alert to wandering children. For aboveground pools, make sure the ladder can be lifted up to prevent unsupervised entry. 7. Remove private waterslides from your pool: With so many more broken necks associated with waterslides, the Consumer Products Safety Commission engaged in a massive study to warn the public of their hazards. Remove slides from your pool immediately. 8. No diving boards on residential pools: Young athletic swimmers can easily strike the transition slope when diving off a board in a residential pool. Removing it will prevent injury. 9. Use Pool Lights for Night Swimming: Install them if you don’t have them. Never Jump or Dive into your swimming pool ! Signs similar to the ones below should be posted to avoid serious injuries or death. Copyright 2011 All Pro Pool Installers. All rights reserved.